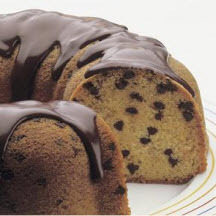 Convenient use of cake and pudding mixes make this chocolate glazed banana bundt cake, studded with chocolate chips, a snap to make. Preheat oven to 350°F (175°C). Grease and flour 12-cup fluted tube pan. Combine cake mix, pudding mix, eggs, water and oil in large bowl; beat on low speed just until blended. Increase speed to medium; beat 2 minutes. Stir in small chocolate chips. Pour batter into prepared pan. Bake 45 to 50 minutes or until wooden pick inserted in center comes out clean. Cool 10 minutes; remove from pan to wire rack. Cool completely. Drizzle with Chocolate Glaze. Chocolate Glaze: Heat 1/3 cup granulated sugar and 1/4 cup water in small saucepan to full boil, stirring until sugar dissolves. Remove from heat; add 1 cup HERSHEY'S MINI CHIPS Semi-Sweet Chocolate. Stir with whisk until chips are melted and mixture is smooth. Cool to desired consistency, then use immediately. Makes about 2/3 cup glaze.